(11594, Oklahoma Historical Society Photograph Collection, OHS). The incorporated town of Pawhuska is situated west of the junction of U.S. Highway 60 and State Highways 11 and 99, fifty-seven miles northwest of Tulsa. Pawhuska is located in central Osage County and is the county's seat and largest community. The town began in 1872 when Osage Agent Isaac T. Gibson established the Osage Agency on Bird Creek in what was then the Osage Nation, Indian Territory. The settlement was named in honor of Paw-Hiu-Skah (White Hair), chief of the Thorny Valley People, one of the tribe's five physical divisions, who dwelled nearby. Traders Dunlap and Florer and Hiatt and Company built stores at the agency in 1872 and 1873, respectively. The Indian Herald, the village's first newspaper, was started in 1875, and the Pawhuska post office opened in 1876. Construction of the Midland Valley Railway reached Pawhuska in September 1905. Reserved from Osage allotment, the 195-acre townsite was surveyed, platted, and appraised. Lots were sold at public auction starting on January 3, 1906. The town had a population of 2,408 at 1907 statehood. Businesses in 1908 included twenty retail stores and four banks. Cattle ranching was an important local industry. 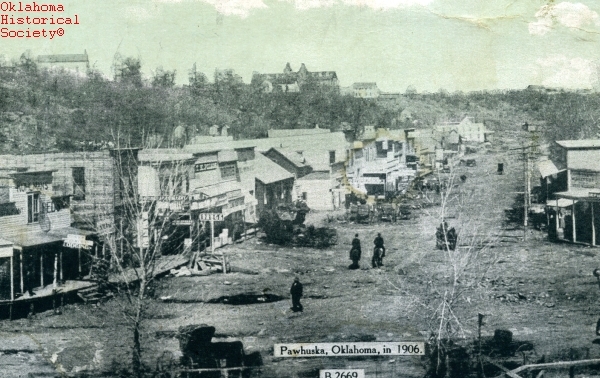 Pawhuska was the scene of public lease auctions during the Osage oil boom of the 1910s and 1920s. Most sales were conducted by Colonel Ellsworth Walters beneath the Million Dollar Elm adjacent the Osage Agency. Oilmen, including Frank Phillips, Lee E. Phillips, Waite Phillips, William G. Skelly, and Ernest W. Marland, attended the auctions. In 1920, near the peak of Osage oil-field production, Pawhuska had a population of 6,414. The Atchison, Topeka and Santa Fe Railway was extended from Owen in Washington County, Oklahoma, to Pawhuska in 1923. Pawhuska newspapers of that era included the Osage Journal and the Osage County News. As the oil boom declined during the Great Depression, a creamery, a brick plant, an ice factory, and a rock crusher provided local employment. Pawhuska had 5,931 residents in 1930, 5,443 in 1940, 5,331 in 1950, and 5,414 in 1960. The town's population fell from 4,278 in 1970 to 3,825 in 1990. In 2000 Pawhuska had 3,629 citizens, a home-rule charter form of government, and a school district enrollment of 1,029. That same year there were 139 local businesses, including sixteen related to the petroleum and natural gas industries, thirty-one retail trade establishments, three commercial banks, and the semiweekly Pawhuska Journal-Capital newspaper. The 2010 census counted 3,584 people living in Pawhuska. America's first Boy Scout troop was organized at Pawhuska in 1909. Pawhuska remains the location of the Osage Agency and is home to the Osage Tribal Museum. Dedicated in 1938, the latter is the oldest tribally owned and operated museum in the United States. Annual community events are the Ben Johnson Memorial Steer Roping and the International Roundup Cavalcade, the world's largest amateur rodeo. Local listings in the National Register of Historic Places include the Immaculate Conception Church (NR 79002015), the Osage County Courthouse (NR 84003395), the Pawhuska Downtown Historic District (NR 86002355), and the Pawhuska National Guard Armory (NR 94000485). The Tallgrass Prairie Preserve is located north of town. Scholar, author, and historian John Joseph Mathews was a Pawhuska native. Others associated with the community are Osage Chief Bacon Rind and actor Ben Johnson, Jr.
"Pawhuska," Vertical File, Research Division, Oklahoma Historical Society, Oklahoma City. Les Warehime, History of Ranching the Osage (Tulsa, Okla.: W. W. Publishing, 2000). Jon D. May, "Pawhuska," The Encyclopedia of Oklahoma History and Culture, https://www.okhistory.org/publications/enc/entry.php?entry=PA020.